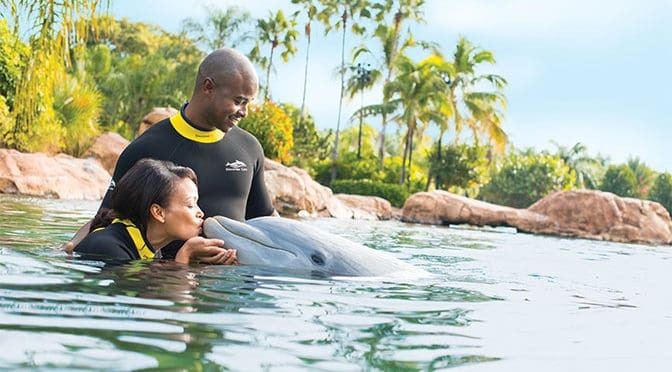 Win a trip for 16 people to Discovery Cove and swim with dolphins! To celebrate its own “Sweet 16” birthday, Discovery Cove today launched a national sweepstakes promotion at DiscoveryCove.com/Sweet16 One lucky winner and 15 friends will win a trip to Discovery Cove, including roundtrip airfare, two nights’ hotel accommodations, transportation and a VIP guest package. During their stay at Discovery Cove, all 16 guests will have the opportunity to swim with bottlenose dolphins, snorkel among thousands of tropical fish and rays, play in a fresh-water river and hand-feed exotic birds in an on-site aviary. The group will have exclusive use of two private cabanas with hammocks, lounge chairs and a well-stocked fridge, as well as complimentary meals, snacks, wetsuits, snorkel gear, towels, lockers and sunscreen. The package also includes tickets to SeaWorld and Aquatica, SeaWorld’s Waterpark. Entry in the sweepstakes is online at DiscoveryCove.com/Sweet16; entrants must be 18 years old and may enter once a day July 1 through August 14, 2016. A winner will be announced on August 15, 2016 via email. NO PURCHASE NECESSARY. A PURCHASE WILL NOT INCREASE YOUR CHANCES OF WINNING. LEGAL RESIDENTS OF THE 50 U.S. (AND D.C.), 18 YEARS AND OLDER. VOID WHERE PROHIBITED. Sweepstakes ends 8/14/16. For Official Rules, prize descriptions and odds disclosure, visit https://app.promo.eprize.com/sweet16. Thanks for sharing! That would be sweet! !